So the title of this post is a little misleading. No, I’m not getting married. Well, yet. I don’t have a fiance, or a boyfriend, or even anyone close to marriage material at this moment in time. But I’m fine with that. I’m only 20 for heaven’s sake. The reason I’m writing this is because, well, honestly I’ve been binge-pinning a lot of wedding stuff on Pinterest lately. Maybe it’s because it’s wedding season, or maybe because one of our clients for my internship works a lot with weddings, I don’t know. Regardless of the reason, I’ve been seeing a lot of white dresses. I know seeing this post A) probably gave my mom/dad/grandma/brother/etc. a heart attack because they thought I was about to run of to Vegas to elope or B) gave any guy that came across it a scare that someone like me was thinking about marriage. Well, rest easy loved ones because marriage is far down the road for Emma. I’m getting to the age where any guy you date could possibly, maybe, someday be your husband. That’s crazy to think about. Almost impossible to wrap my mind around. But it’s true. With that being said, I’m cautious about who I let into my heart. This is not the time to be giving your heart to anyone that jumps in front of you. In my opinion, it’s a precious commodity. Brace yourselves, time for a story. Back in eighth grade, I was a part of a YoungLife bible study that was only for eighth graders. Some of my very good friends were in it, and the leader happened to be one of my best friend’s older sister. I remember we talked about boys and marriage and love and all of that fun stuff a lot, but one day we wrote the verse above out on index cards and took them home. I don’t remember the lesson, or why they were written out, but I happened to stick that index card in my mirror at home. When I moved that mirror it was moved to my closet wall, then to my bathroom mirror and so on. Wherever that index card moved, I saw the verse almost daily, unintentionally. Slowly, the verse became something I not only would tell myself in my head every so often, but it became an important reminder constantly in my life. I would always happen to see the index card right after trouble with boys in high school and it was as if Jesus just knew I needed a reminder. The boy causing the trouble did not deserve my heart. And it made me feel better, every single time. Fast forward to present time. Now that I’m of age to potentially meet a suitor (WOW, that sounded so old-timey and lame I’m so sorry), I’ve begun to narrow down my list of absolute, must-haves for a husband, or at least a solid boyfriend. Although I mature and change my mind on many things over time, one requirement always stays true: He must be a man of God. I can’t picture a life with someone who can’t get on his knees to pray with me, or go to church on Sunday’s with me, or teach our children (again- a formaility) to love Jesus. Not only can I not picture it, but I know that I have a Godly man waiting for me, and to give my heart to someone without Christ in their life would simply be a mistake. This is why I’ve begun to pray for my future husband. This doesn’t mean I’m praying “God, can a super cute, Jesus-lovin’, golf-playin’ man knock on my door tomorrow?” No, I’m praying for whoever might be my husband to be the Christian man he was made to be. Pray your future husband has a relationship with God. Pray your future husband makes good decisions. Pray your future husband will love you always. Pray your future husband is Godly even when no one is looking. Pray that your future husband loves God above all. 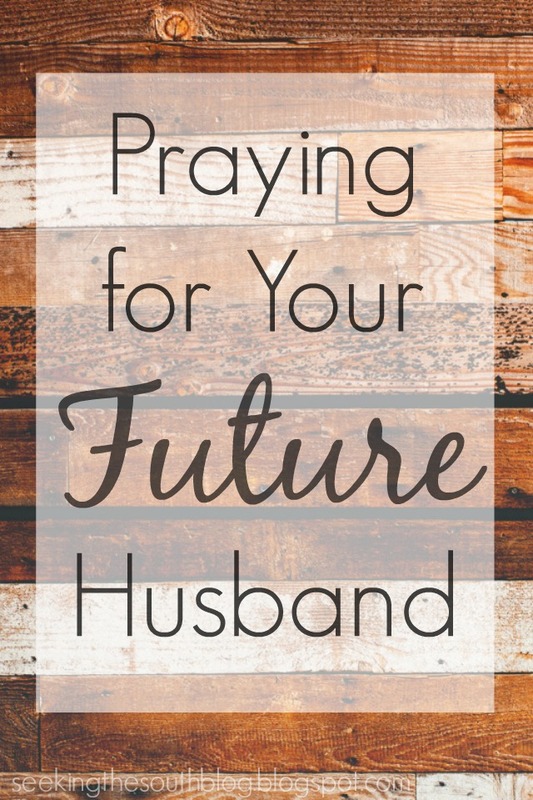 Pray that your future husband will be prepared to be the spiritual leader of your home. Pray that your future husband will show your [possible] children the Lord. Dear Lord, please let my future husband be following you, that he loves you, that he has given his life to you. Please let him be a man of good character and that he loves others before himself, but loves you most of all. Please let him love me deeply, and to never stray. But Lord, keep him safe, away from harm and let him find me when the time comes. It’s simple, but it gets the job done. Marriage is a big deal to God. Heck, it’s a deal to all of us. Like I said above, I’m not just going to give my heart away to anyone. I pray that out of all the people that read this post, that one person prints this, and puts it in their bible, or their nightstand or somewhere where they can pray it every night. It’s been quite a while since I’ve written a religious post like this, but I like it, so I’m going to do it more often! Hope you enjoyed it half as much as I enjoyed writing it. Next Post What’s in My Makeup Bag?